The original Jurassic Park movie came with the tagline ‘an adventure 65 million years in the making’ – the sequel, Jurassic World, took a rather shorter 22 years to come to fruition. 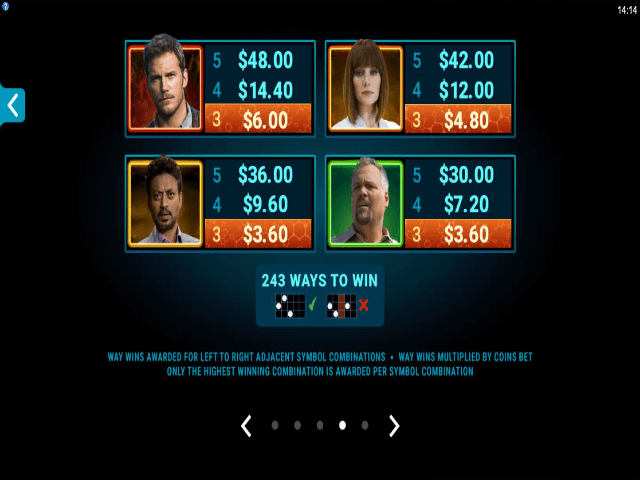 It's this contemporary re-working that Microgaming has based the Jurassic World slot game homage upon, and from that first spin of the reels the action doesn't stop. 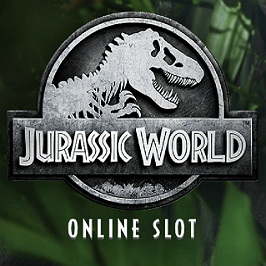 The Jurassic World online slot machine boasts Microgaming’s ‘243 ways to win’ technology, myriad of special symbols and bonus games, and a jackpot prize of some 14,000-times your stake. 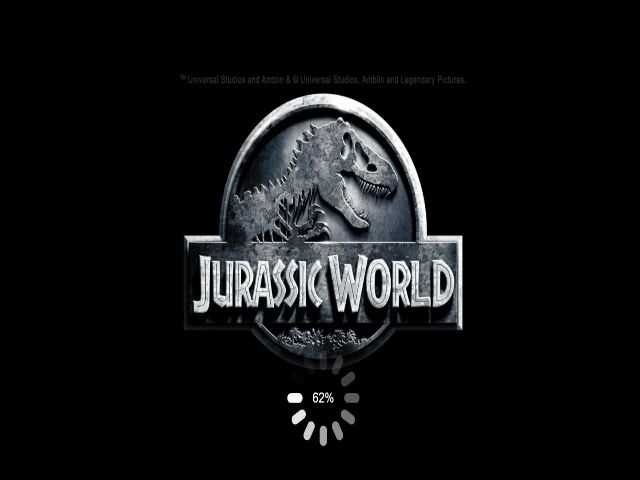 There's a simplicity to the Jurassic World slot game, and if that sounds like a criticism, it isn't. 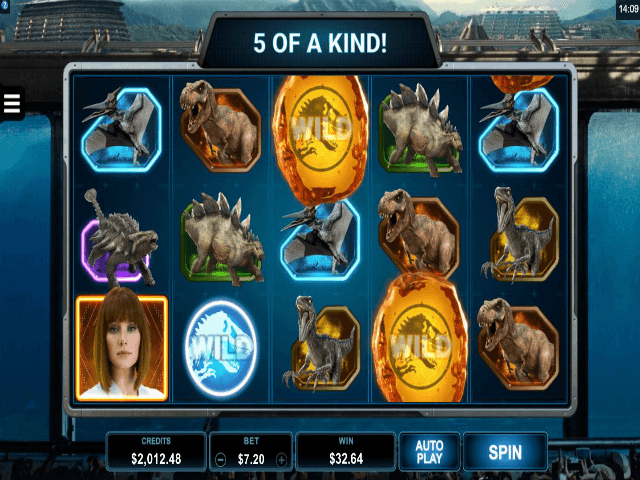 There's plenty to recommended about this high-octane offering, so read our review of the Jurassic World slot to find out more. 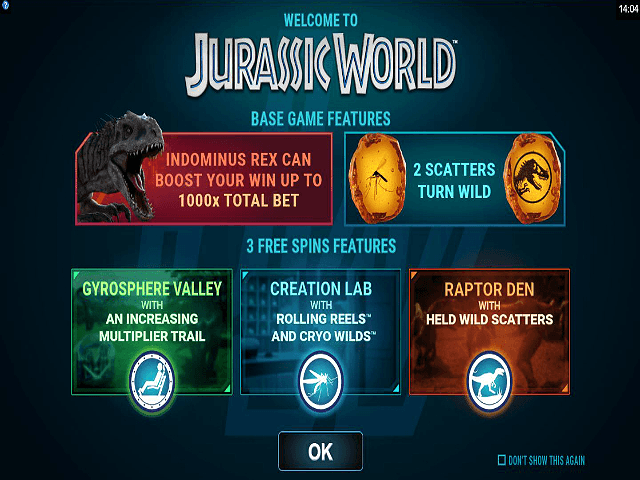 The Jurassic World slot features five reels and a whopping 243 ways to win courtesy of this particular casino software. Rather than acting as paylines in the traditional sense, these are pre-ordained winning combinations that ensure each spin of the reels will have players on the edge of their seats. Microgaming has inked an exclusive deal with Universal Studios to bring the Jurassic World franchise to life, so gamers can expect plenty of similarities with the original movie. The basis of the game is Chris Pratt’s character Owen Grady, who's the dinosaur wrangler tasked with saving the day when the short-tempered creatures manage to escape and wreak havoc in the park. Also featuring are Bryce Dallas Howard, Irrfan Khan and Vincent D’Onofrio as their original characters, as well as six dinosaur species: Velociraptor, Pteranodon, Stegosaurus, Ankylosaurus and the awesome duo the Tyrannosaurus and Indominus Rex. These hold the key to the game’s major payouts and trigger the free spins bonus round, which in itself features three mini games. All of the human and dinosaur characters act as the main slot game symbols, and these pay out a variety of prizes for matching three to five on one of the relevant 243 ways to win. The top-paying icon is the movie’s hero, Owen Grady. The two key symbols are the wild, which is the classic Jurassic Park logo, and the scatter, which is the insect trapped in the scarab that made dinosaur genetics possible. The wild, which can be stacked ten high on your reels, substitutes for all other icons (apart from the scatter) and pays out a handsome prize for landing three-five. The scatter serves up three rewards: it pays out in its own right for three-five, two scatters will turn wild to create new wins, and three scatters triggers the free spins round. Gyrosphere Valley – ten free spins, with a chain multiplier increasing by one-times for each non-winning spin. Creation Lab – ten free spins are played out on rolling reels, meaning that winning symbols are replaced with new ones that can trigger further wins. Raptor Den – ten free spins with wild scatters. Five more freebies can be earned to take your tally up to 15. If you like Jurassic World - You'll like these slots too!